Wasabi and Nadaman's $30 lunch teishoku of tempura, sashimi and grilled fish is popular. There's been some confusion in the switch from Wasabi Bistro to Wasabi & Nadaman, but fans of the bistro have been relieved to see Kumi Iseki and many of her employees still involved in the new joint endeavor with the Japan-based culinary giant, which allows her more freedom to pursue other avenues for Wasabi Bistro. The footprint is the same, intended to make guests feel welcomed into a beautiful home that opens to a covered lanai and waterfall. The most delightful aspect is rows of circular blue lights emanating from the stone floors, suggesting a sense of lightness and play, which makes the room a lot less intimidating to the first-timer. The same holds true of the small bouquets of flowers gracing each table, recognizable as the work of Rainforest, at nearby Kilohana Square. In recent months I have enjoyed some fabulous meals in New York and Las Vegas. I will, at some point, elaborate on my visit to Alex at the Wynn, where the high-end seasonal tasting menu with wine for two will run you $650 before tip. It was this restaurant I was thinking of when I visited Wasabi & Nadaman. My first thought was that I might have enjoyed Wasabi & Nadaman a lot more if I had never been to Alex, where the cuisine is exceptional. But on second thought, I realized how cultural differences affect our expectations and appreciation of food. At both restaurants, cuisine is elevated to art form, but the approaches are quite different. At Alex, as at most Western restaurants of this caliber, the aim is to capture the essence of ingredients, heightening and highlighting flavors to dazzle the palate. Wasabi & Nadaman attempts the same in a more subtle way with its kaiseki menu, with an additional layer of seasonal symbolism. Though many of us believe we know the Japanese culture by way of its pervasiveness here, we only know it in a hapa way, filtered through American eyes, and if you can't grasp the food's symbolism, you might not fully understand what the fuss is all about. That said, relax. It's not as ponderous as food writers -- we who goad chefs to push cuisine to the outer limits -- would make it seem. 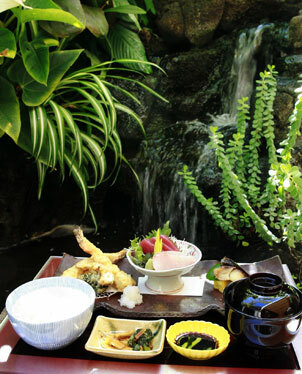 Kaiseki is only one aspect of the menu, and one that a diner might be compelled to seek out only a few times a season. For all the other days of the year, you can opt for a more casual approach by ordering izakaya-style and sushi offerings a la carte, such as soft-shell crab karaage ($12) to rival any you call your favorite thus far. And sashimi here is a real treat, at $20 for three kinds of fish and $35 for five kinds, which might include maguro, hamachi, saba and chutoro, that nearly melt on the tongue. My companion and I harmonized in rhapsodizing, "Omigod," as we savored each morsel. I think most diners will enjoy the a la carte menu far more than the kaiseki, which requires a mouth-to-brain connection, in addition to the standard mouth-to-stomach pathway. In between is a $50 sampler set that starts with three kinds of appetizers from the kaiseki menu, followed by foie gras chawanmushi -- which prompted another "omigod" moment, the rich goose liver mingling with the egg custard and topped with shark fin sauce to create an experience comparable to nibbling on uni -- two kinds of sashimi and your choice of salmon teriyaki, prime sirloin, miso butterfish or fried chicken, served with rice, miso soup and pickled vegetables. 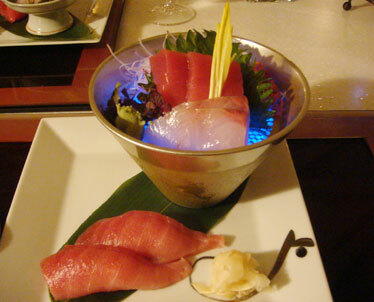 Sashimi that is part of the kaiseki meal glows with a blue light. IF YOUR MIND is open to ritual and the experience of having a Japanese forest, mountain and seashore at your table, by all means try the kaiseki ($80 per person), at this time of year honoring the autumn harvest and such seasonal ingredients as chestnuts and maitake and shimeji mushrooms, while other ingredients such as mentaiko (pollock roe) and chrysanthemum are representative of fall's reds and yellows. It helped that what arrived next was a basketful of goodies: a cool salad of maitake and boiled mizuna; two pieces of steamed duck breast with a whisper of curry; vegetables coated in a bleu cheese and tofu dressing; prawn marinated with mentaiko and a crunchy minidice of mountain yam; and small pieces of grilled eel and burdock wrapped like a slim cigarette in bean curd, then fried. By the soup dish, I was totally won over by chef Kato Michihisa, Japan's original "Iron Chef," according to Iseki. The soup was served in a ceramic teapot, the smoky shimeji broth poured into little teacups to be enjoyed before opening the lid and helping oneself to pieces of the mushroom, fish and prawn inside. The dish was particularly welcome in light of recent chilly rain. Next up was sashimi, followed by another comforting simmered dish of daikon, hollowed out like bamboo and filled with pieces of fish and daikon served in yuzu miso sauce. Balanced on top of the arrangement were two "twigs" of deep-fried, pale green soba intended to represent pine needles. The arrangement also was surrounded by more fall "leaves" of miniature potato and carrot crisps, while a lone gingko nut stood in for a pine cone on a forest floor. The next dish, of wagyu steak and mushroom ishiyaki, needed no explanation. This was the filler, five cubes of tender, partially grilled steak and mushrooms presented with a stone grill for finishing at your table. Those who like rare beef might find no further cooking necessary. Last to arrive was the rice, cooked with chestnuts and stirred at your table. By this time you should be pleasantly full. If there's room for dessert, azuki beans with mochi is lighter than it sounds.